Southwest Aquatics was founded in 1981 by Dr. Paul R. Beaty. Prior to beginning work on golf course lakes, Dr. Beaty was successful in evaluating the use of an herbivorous fish to control vegetation in irrigation canals in Southern California. His research led to the legalization of this fish, the White Amur or Grass Carp, in the Western United States. Use of the fish has saved irrigation districts millions of dollars essentially eliminating expensive chemical and mechanical control methods. Southwest Aquatic’s early focus was on lake and pond maintenance. Dr. Beaty’s scientific background and approach changed golf course lake management forever. He knew chemicals alone were not the answer and he incorporated a more environmentally sound approach which we still use today. Dr. Beaty saw a critical need for aeration and circulation equipment installation, and repair. Sub-contracting this work took too long and the health of the lakes suffered as the water became stagnant. Dr. Beaty hired key staff and together they brought repair and maintenance of pumps, aeration and fountains under the Southwest Aquatics umbrella. Today we are distributors for the nation’s top floating fountain and aeration manufacturers. We have also incorporated preventative maintenance programs to avoid equipment down-time. If and when there is a mechanical problem, we can have your equipment back up and running within 24 hours. Lake construction and repair by Southwest Aquatics was also born out of necessity. The local lake construction companies didn’t appreciate small lake projects and none were interested in small scale repairs. Again, key employees were hired and Southwest Aquatics began building and fixing golf course and private estate lakes and ponds. Today we have the expertise, equipment, and man power to design and build the pond of your dreams. In 2008 Dr. Beaty retired and sold the business to his son Chris. 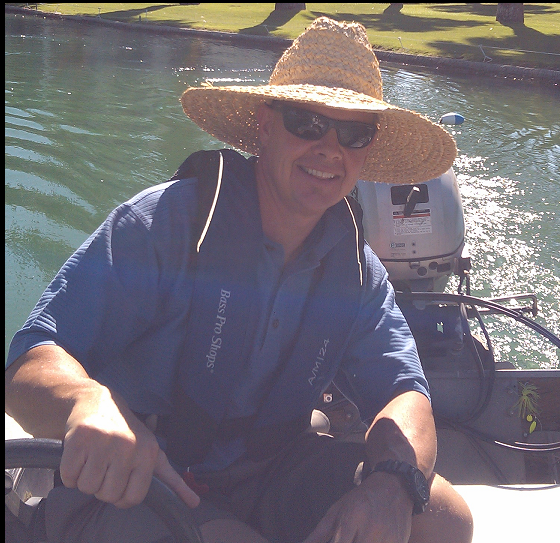 Chris Beaty holds a Bachelor’s Degree in Biology / Aquatic Ecology from Northern Arizona University and has been maintaining, studying, designing, building, and repairing desert lakes and ponds for the past 20 years. Chris is also a certified Pest Control Applicator, Certified Scuba Diver, and a Licensed Contractor.